The Woodlands Waterway Trolley, which offers free transportation throughout The Woodlands Town Center, will expand its service during the holiday season. 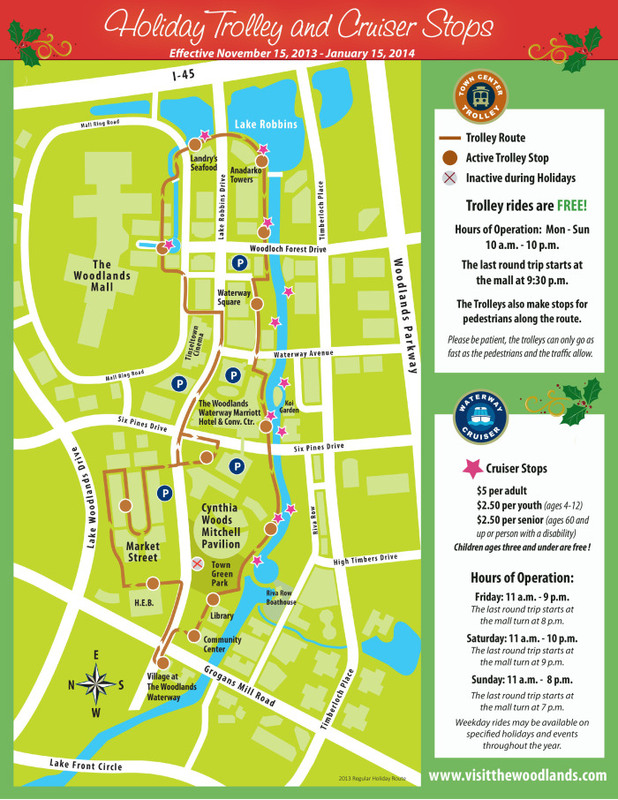 Beginning November 15, 2013 through January 15, 2014, the Township will operate three trolleys to improve accessibility to shopping, dining and entertainment venues throughout The Woodlands Town Center during the holiday season with continuous daily service from 10 a.m. – 10 p.m. The Trolley is expected to be at each stop every 15 minutes. The service also will add a pick-up and drop-off spot at the Town Center Parking Garage at The Cynthia Woods Mitchell Pavilion, where parking is free during the holidays. However parking may not be available in the Town Center Parking Garage on certain days due to events at The Cynthia Woods Mitchell Pavilion or The Woodlands Waterway Marriott Hotel & Convention Center. The Woodlands Waterway Trolley will continue to service passengers at The Woodlands Mall, Landry’s Seafood, Anadarko, Waterway Square, The Woodlands Waterway Marriott Hotel and Convention Center, The Cynthia Woods Mitchell Pavilion, the South Montgomery County Library and adjacent Community Center, West Lake Robbins Drive, Market Street Central Park, and H-E-B at Market Street.